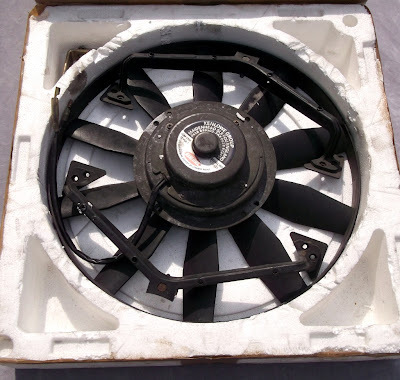 Would anyone out there like an electric fan for their Opel or Vauxhall? This one was fitted to an Opel Manta B series GT/e and I'm sure that, as claimed, it saved the owner fuel and improved performance. Electric fans do this by taking away all the unnecessary drag that a standard mechanical fan places on the engine. Who needs the fan running in freezing temperatures or on the open road? 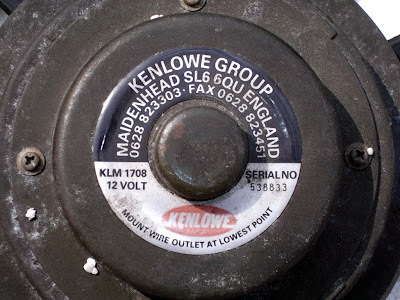 Furthermore, on those occasions when fast motorway traffic suddenly grinds to a halt, this type of unit will kick in and stop your engine from cooking its gaskets. I didn't realise that the Kenlowe company pioneered thermo-electric engine cooling over 40 years ago and the principles have proved so successful that over 85% of the world's cars produced annually adopt this concept. Today Kenlowe produce the widest range of thermo-electric fans, engine pre-heating, oil cooling, and heating / ventilation / extraction systems ensuring that Kenlowe remain at the forefront of air movement and temperature control. Kenlowe supply original equipment car manufacturers with fans and all the Formula 1 teams with pre-heating systems. I have tested the fan; it turns freely and runs quietly. These fans can cost from £60 upwards when new, I am offering the kit with the thermostatic control unit for just £35 plus p & p.